VEI implements the FDW project "Sustainable Water Services Beira" with our partner FIPAG in Mozambique. In addition to large-scale investments at the drinking water production plant and in the distribution infrastructure, investments are also being made on personal development of FIPAG employees. The development plan for the employees focuses on subject-specific skills, but also on management skills, ethics and behavior. 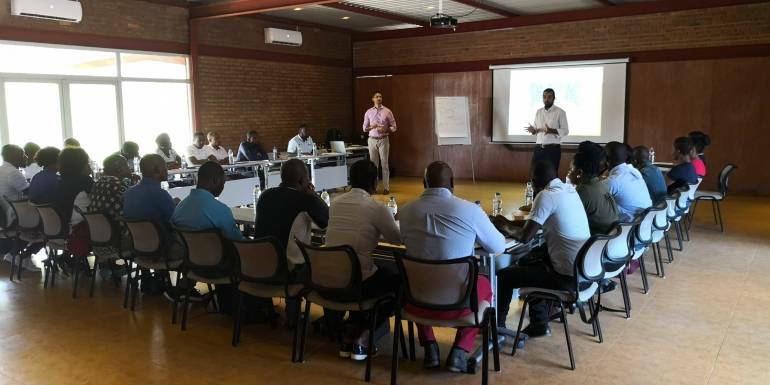 On 29 and 30 January, FIPAG Beira's first and second line managers were trained on team engagement skills and teamwork. These modules are part of a large intensive change management program that the managers go through. Important items that have been dealt with during these two training days include; prioritization of tasks, efficient delegation, constructive feedback and the process teamwork. The total training program goes over a period of approximately 1.5 years in which managers are thoroughly trained and coached. The training consists of blocks with group training that alternate with individual coaching trajectories for the first-line managers.